Axel Steiner was born and grew up in Wiesbaden, Germany, where he started riding as a youngster. His first show was the famous Wiesbaden CDI, where he showed in Dressage Seat Equitation at the age of nine. He later attended the well known dressage meccas of the Reitinstitut von Neindorff and Warendorf. In 1961, Axel emigrated to the US (San Antonio,Texas) to join the Air Force. While waiting to be accepted and thereafter while stationed in Texas he started teaching basic horsemanship and dressage. During these early days, he also competed throughout the Southwest on the horses of the US Modern Pentathlon team. 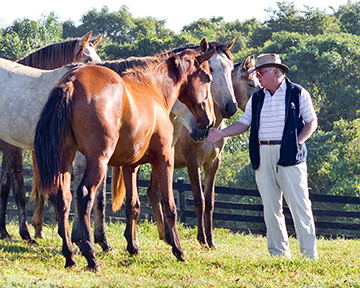 In 1968, Axel received his first judging credentials, and he has been judging and teaching ever since. Even when his military duties took him to locations throughout the US and foreign countries, horses were always a part of his life. His skills and unfailing eye were recognized by riders and officials alike, and he was promoted quickly through the many judges' classifications. An FEI "O" (now 5*) judge since 1988, he has judged Olympics, World Cup Finals, Pan American Games, and many other championships here in the US and throughout the world. 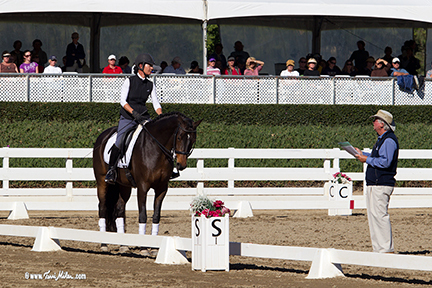 Along the way, he participated in the founding of the USDF in 1973, became a member of the USDF "L" faculty since the inception of the program, and has been a long-time member of the USEF Dressage Committee. Axel balances his judging duties with teaching and clinics around the country, which keep him "in touch" and appreciative of the look and feel from both "A" and "C". Axel retired from the US Air Force as a Lt/Col. He has a son, a daughter, and three grandchildren, and in 2000 he married the well known photographer and painter Terri Miller. They now live happily in Lake San Marcos, which is just north of San Diego. 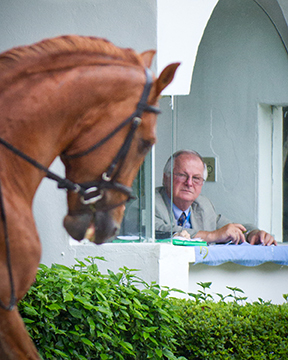 Fourth level is the last National dressage level and prepares the horse and rider for the International levels. There are a lot of new requirements in this level including a collected walk, very collected canter, walk pirouettes and multiple flying changes on the diagonal. In this video, Axel and rider, Skyler Evans, take her 9-year old Westphalian gelding through some of the basic movements required in Fourth Level Tests.